Home » Pension Plans Running Out of Solutions – Who Will End Up Footing the Bill? The outdated pension system in U.S. cities and states is “short by $4 trillion” according to a Moody’s estimate, making it equal to Germany’s entire economy. Being forced to “take deeper cuts” from a program that promised certain payouts in retirement isn’t viable, either. And increasing taxes to pay for more government mismanagement of these state and city funds isn’t appealing for anybody. New Jersey may run out of pension funds in as little as 12 years. Kentucky was 84% underfunded in the 2017 fiscal year. One municipal fund in Chicago was more than 70% underfunded. In fact, the stark reality of “relinquishing money owed” seems to be playing out in Central Falls, RI. 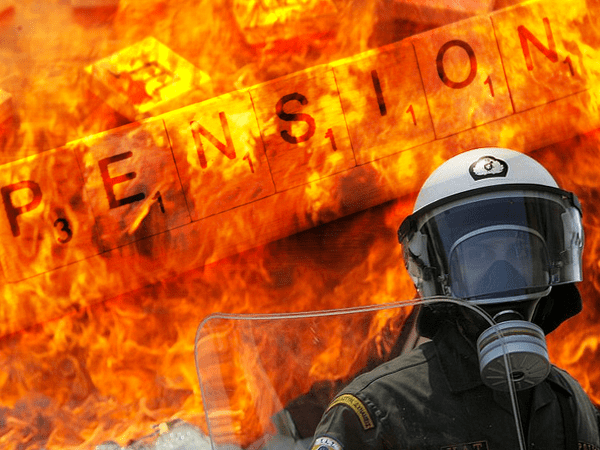 There, retired police and firefighters are considering slashing their pension payments by up to 55%. The city filed bankruptcy in 2011, and even though it’s doing better now, the retirees aren’t getting their pensions back. 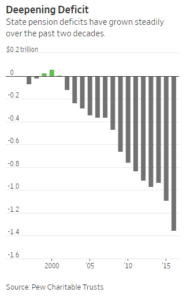 And as you can see from the chart on the right, this deepening “pension pit” shows no signs of stopping. Looks like the 20th century trade-off of lower pay in exchange for a solid retirement could end up being a broken promise. There’s really no good solution for the problem either. Cut benefits and the police might quit because of those cuts. Then, as a result, crime could rise like it did in San Jose, CA, forcing the city to roll back the cuts. But even though options are dire, at any point other cities in the U.S. suffering from their own “pension pit” will have to pay the piper. And some, more desperate cities, might follow Philadelphia’s lead and take an entirely different turn. But more than anything else, it’s Philadelphia’s dull, maddeningly complex and immutable pension system that has sapped the strength of city government. There is no single greater drain on the city’s capacity—to fight crime, to fund education, to clean the streets or to cut taxes—than pensions. But even though its pension plan is underfunded by 50% and continues to plague the city’s economy, Philadelphia isn’t giving up. The city could have cut its losses and dropped the bloated pension program. Or, it could have tried a simpler, more reasonable solution and cut management and hedge funds. According to Sovereign Man, the city government is placing liens on some property owners who are a little delinquent on their gas bill from Philadelphia Gas Works (PGW). The city of Philadelphia owns the local gas company– Philadelphia Gas Works (PGW). It’s essentially a local government monopoly. According to this lien, before a property owner can sell their home or pull needed equity out of it, they will be forced to pay the debt to this power company. The city, which has a monopoly on the power sector, then uses the cash to fill its pension coffers among other things (like payouts to managers and hedge funds). Philadelphia can put this lien on a property without notifying the owner, even if that owner is a landlord who has a tenant who didn’t pay their power bill. Talk about throwing morality and ethics out the window. This pension problem is rapidly spreading nationwide. Pretty soon, pensions could be a thing of the past. In fact, according to the latest Pew Research, as of January 2017 only 4 states in the U.S. are funding their pensions at 90% or better. That number is sure to get worse as time goes on, while the U.S. “pension pit” continues to get deeper. Most retirees don’t have a “Plan B” to cover the bases if Social Security or pension payments keep getting cut. If you don’t, you’re limiting your ability to stay afloat. Don’t let your retirement get swallowed up by the “pension pit.” Now is the time to find a retirement plan that’s known for its security and reliability.